Almost Unreal: 18 and still counting...??? I came across a quite an interesting news while browsing Pople's website. 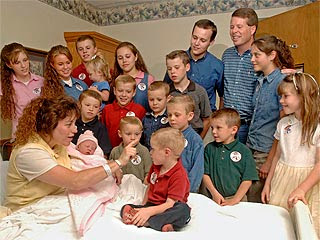 It was about this Duggar family who has the 18th child...wow. I wonder where they get all the energy from:P. It makes me wonder if my good friend Kima, formerly known as Silverchild, would be able to top that..hehe. Jim Bob and Michelle Duggar of Tontitown, Ark., had their eighteenth child Thursday – Jordyn-Grace Makiya, who joins the rest of her J-named siblings. Jordyn-Grace was born via C-section at Mercy Medical Center in Rogers, weeks before her due date of Jan. 1. She weighed in at 7 lbs, 3 oz and was 20 inches long. "Mother and baby are resting and doing well," says a rep for the Duggar family, whose crowded house is featured on the TLC network show 17 Kids & Counting. For Jim and Michelle Duggar, eighteen isn't enough. After welcoming a 7-lb., 3 oz. daughter via C-section on Thursday to join their 17 other children, the proud papa tells the Associated Press: "We both would love to have more." The Duggars now have 10 sons and eight daughters, ranging in age from 17 months to 20 years, all with first names starting with the letter J, including the newborn addition, Jordyn-Grace Makiya Duggar. "The ultimate Christmas gift from God," said Jim tells AP. "She's just absolutely beautiful, like her mom and her sisters." The family's crowded house in Tontitown, Ark., is featured on the TLC network show 17 Kids & Counting, which will have its name updated to reflect the birth of No. 18. Thought this is not my business but I wonder how they looked after the kids. They have to be quite a well-to-do-family and they must be. If the mother's health is good..she must've been blessed with all the health...just imagine having 18th child and still doing fine. Not only that, already think of having the next..wow. My sister had has 3 kids and after that the doctor won't let her have another one. This makes me realize how blessed the Duggars family is and they all looked healthy and happy. OMG! the mother is really strong. Will the parents remember all the name of there chindren. This is a type of strange passion. God bless them. I would rather suggest them to name their childern 1,2,3.....18,19...Easy and goes Infinite.... ROTFL!. No this is just an example of stupid selfish people. I really wish TLC wouldn't patronize stupid people like this.